What an awesome couple of trips! 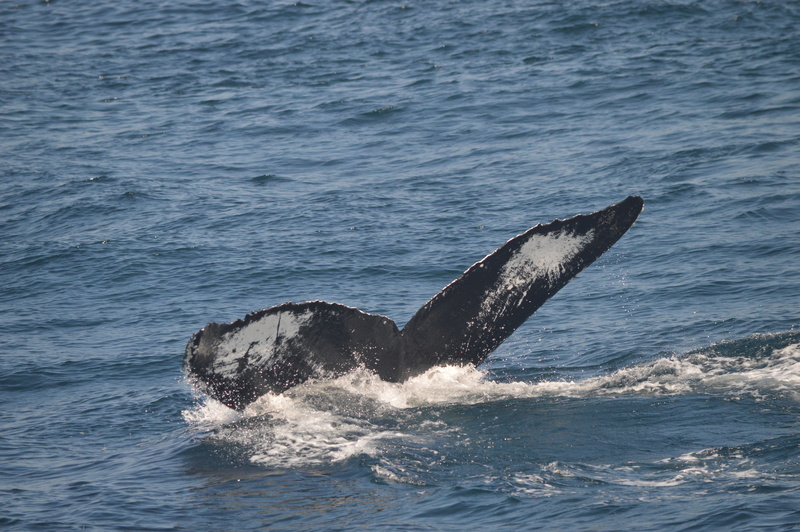 We started the day out watching Pinball, a humpback we haven’t seen in a few weeks. 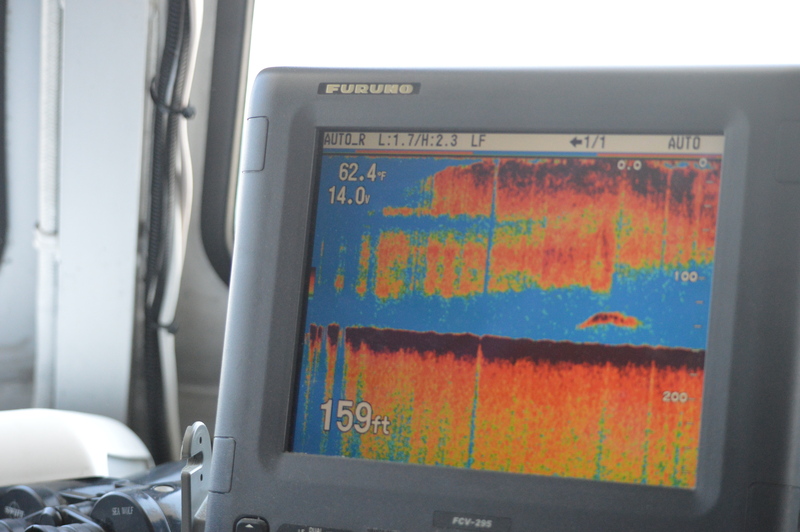 She was doing some deep feeding, and with a lot of bait in the area it was evident why we found her on northern Stellwagen Bank. The afternoon included the most surface we activity we have seen in a long time. Pinball started with kelping, a behavior we almost never see, but have witnessed twice in just over a week! 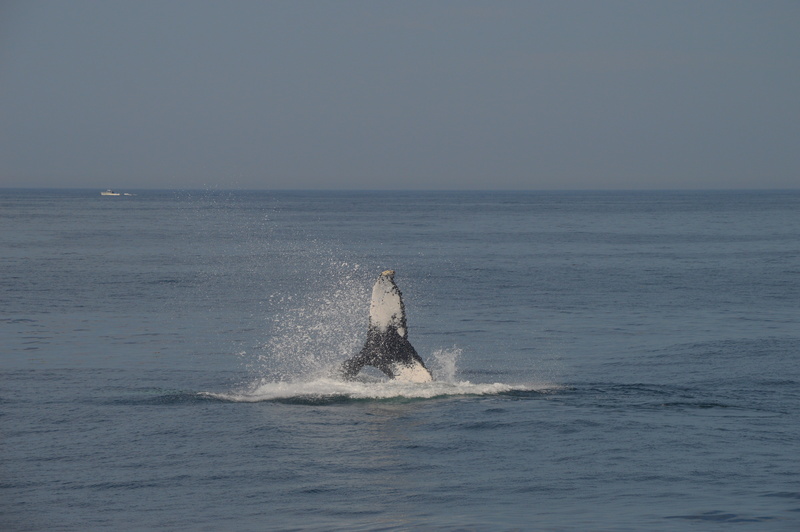 She also did some tail breaches, tail slashing, and brought her pectoral fins out of the water! With the beautiful weather and some great conversation with passengers, it was a fantastic day! What a great day! 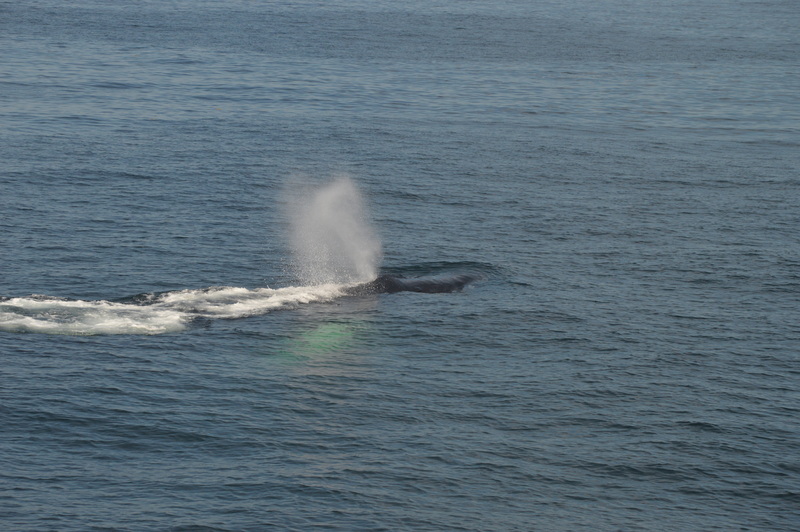 We started our morning trip with Satula, a humpback whale we have seen numerous times this season. 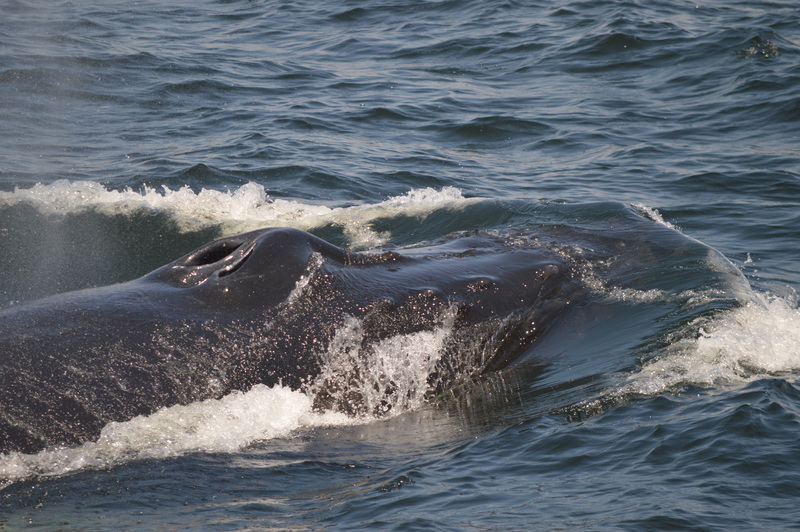 He was taking some short dives and staying at the surface for long periods of time, making for a great whale watch! 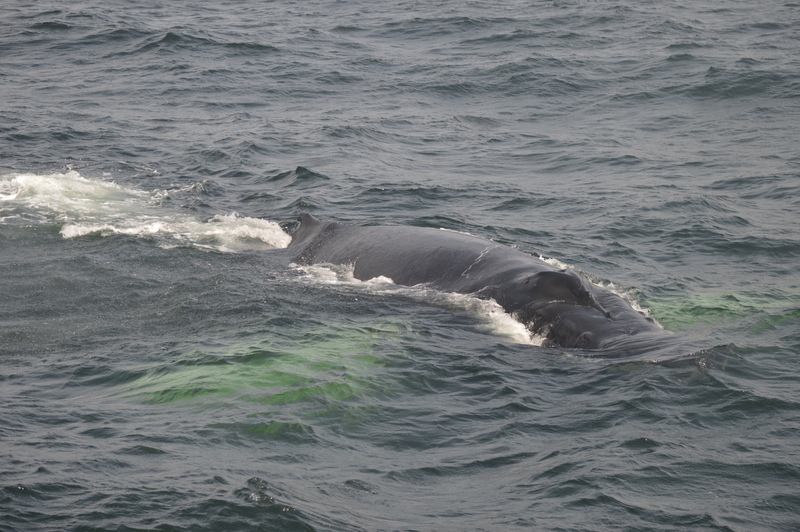 We also got to see a number of fin whales, as well as minke whales. It was great to see a number of different whales again! The afternoon proved to be just as exciting as the morning! After some great, close looks at a blue shark, we watched Satula again, and also five fin whales and seven minke whales. 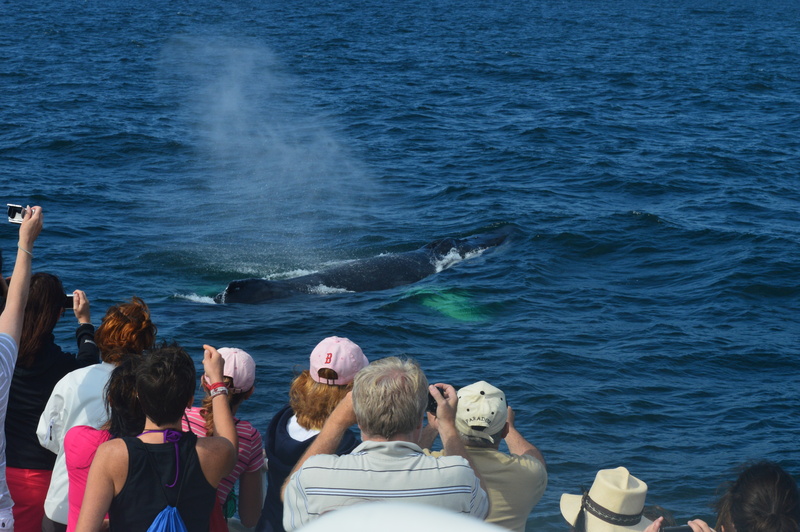 This was the most whales we have seen on any one trip in the whole season! The highlight of the day was watching Satula approach and play in a patch of seaweed on the surface of the water. 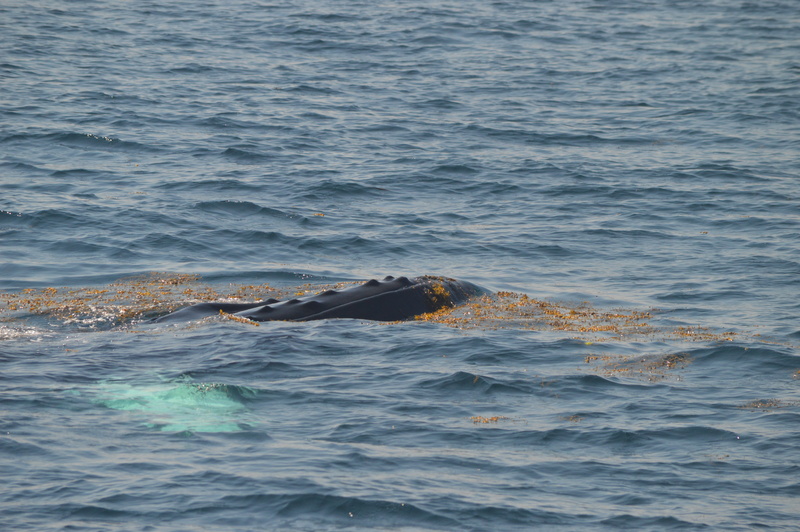 This is a behavior called kelping, and has only been seen a small handful of times by crew members who have been with Cape Ann Whale Watch for more than ten years! While the number of whales in the area over the last couple of weeks have been scarce, the location that we have been finding them in has been fairly predictable. We headed to the southern edge of Jeffery’s Ledge where we found Pinball- no surprise! We had some great looks at her again- she has been a great whale to watch this season! Pinball surfaced close to the boat, and then turned and faced us! There were reports of another whale in the area so after spending some time with Pinball, we moved off to check it out. We always use our cameras for photo identification of humpback flukes on every trip, but we were very sure of who this whale would turn out to be. Sure enough, we spotted Satula’s unique dorsal fin and knew right away. It has been neat to see the same whales so often, and to get an even closer look into the daily life of a humpback whale! 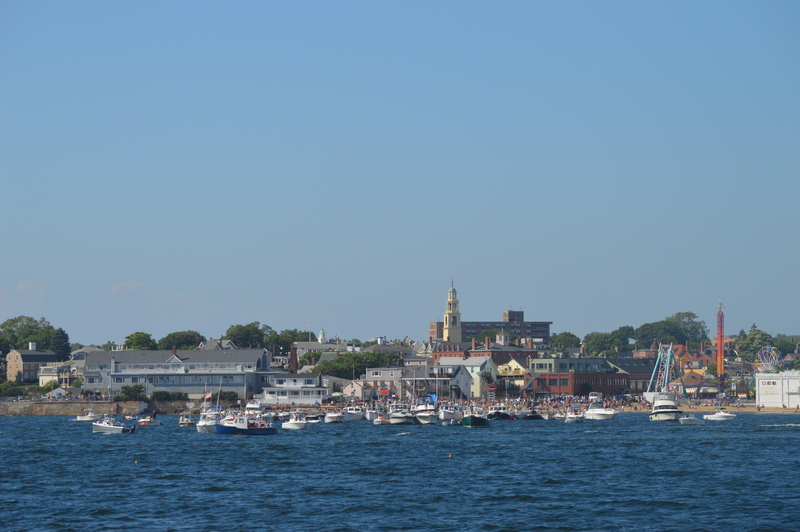 After some good looks at Satula, we headed for home and were able to see the boats lined up for the greasy pole competition and seine boat races that are a part of Fiesta, a celebration of St. Peter, the patron saint of the fisherman. It’s always cool to have the perspective of seeing everything from a boat! Spectators watching the greasy pole competition from boats and the beach. We didn’t have to travel very far before finding our first whale of the day, a humpback. We were able to easily identify the whale as Satula, who we have seen fairly regularly for the last couple of weeks. He was taking pretty short dives and staying near the surface for a handful of breaths, so we had some great first looks! After a little while, however, his dive times became longer and he was surfacing far from where he dove. We quickly realized he was feeding, as evidenced by bubble clouds rising to the surface behind him, then by a enormous patch of bait on our fish finder. The fish must have moved closer to the surface, because we gad some awesome looks at Satula feeding near the surface. We also watched a couple of minke whales, very likely to also be feeding on the fish.